The San Jose Blog: 2014 Downtown Doors Expands to 91 Locations! 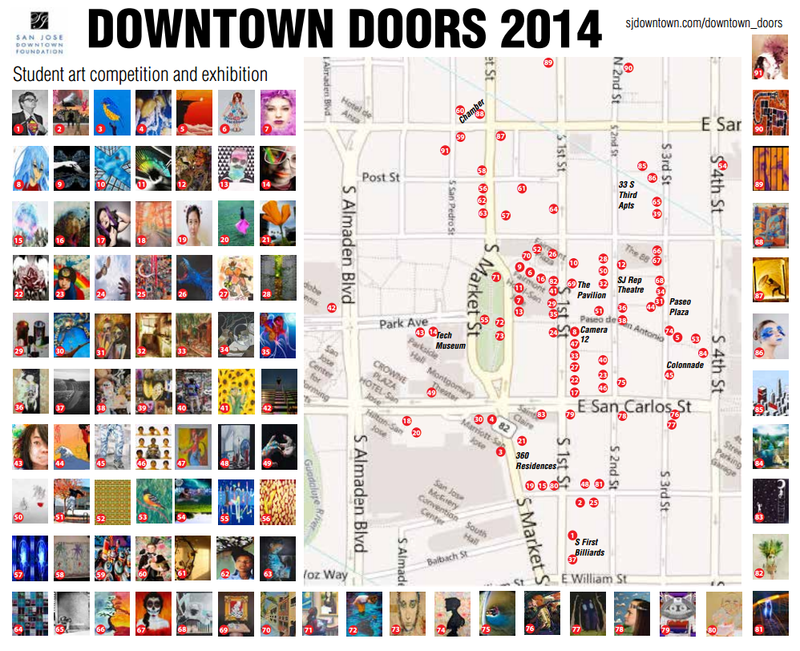 2014 Downtown Doors Expands to 91 Locations! Downtown Doors is a fantastic program that allows student art to be featured throughout Downtown San Jose by turning a typically boring object--doors--into thought provoking art. For 2014 the program is undergoing a substantial expansion, both in the number of locations and the scope of the art. 21 additional San Jose high school students are now featured Downtown across 11 brand new locations and 15 sites that have been refreshed. 5 of the locations feature art from students at our sister cities of Dublin (Ireland), Okayama (Japan), Pune (India), San Jose (Costa Rica), and Tainan (Taiwan). 11 of the students have even posted YouTube videos that explain the inspiration for their piece and how they feel about being selected. You can find these videos along with more information about the program at the Downtown Doors website over here. Below is a handy map that shows where the art is located, which you can click to enlarge and print it out.